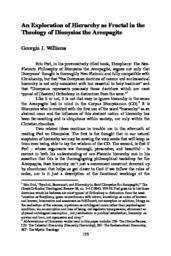 Eric Perl, in his provocatively titled book, Theophany: The Neo-Platonic Philosophy of Dionysius the Areopagite, argues not only that Dionysios’ thought is thoroughly Neo-Platonic and fully compatible with Christianity, but that “the Dionysian doctrine of cosmic and ecclesiastical hierarchy is not only consistent with but essential to holy tradition” and that “Dionysius represents precisely those doctrines which are most typical of [Eastern] Orthodoxy in distinction from the west.” Like it or not, it is not that easy to ignore hierarchy in the sense the Areopagite had in mind in the Corpus Dionysiacum (CD). It is Dionysios who is credited with the first use of the word “hierarchy” as an abstract noun and the influence of this abstract notion of hierarchy has been far-reaching and is ubiquitous within society, not only within the Christian churches. Two related ideas continue to trouble me in the aftermath of reading Perl on Dionysios. The first is the thought that in our natural suspicion of hierarchy we may be sowing the very seeds that will keep us from ever being able to tap the wisdom of the CD. The second, is that if Perl – whose arguments are thorough, persuasive, and beautiful – is correct in both his understanding of neo-Platonic hierarchy and in his assertion that this is the thoroughgoing philosophical backdrop for the Areopagite, then hierarchy isn’t just a convenient construct dreamed up by churchmen that helps us get closer to God if we follow the rules of order, nor is it just a description of the functional workings of the mystical and sacramental life as understood within the Eastern ascetic tradition; though neither of those understandings would be wrong per se, both would be deficient. If Perl is right, Dionysios understood all creation to be Theophany, and hierarchy as the very structure of the entire created order, which reflects the life of God in existence. This hierarchy is not an “optional extra,” and opting out of participation – in so far as this is even possible – is, quite literally, to use the words of St. Paul (Rom 1:25), “exchanging the truth for a lie” and straightforwardly spells physical and spiritual death. For those of us with anarchist (or at least rebellious) tendencies – for those who have a developed sense of justice and despise hierarchical abuses – the news seems bad. If Perl is right, running away from Church structures won’t solve this problem because you can’t run away from the structure of existence itself. What exactly are we supposed to do? St. Symeon the New Theologian’s solution was to argue that the true bishop is the person with a pure heart (he had monastics in mind); but Dionysios’s fiery 8th Epistle to the monk Demophilos makes it more than clear that he does not see this as a possible solution for the very reason that hierarchical order is violated. Abolish the structure of reality we cannot. Nihilism doesn’t seem a very attractive option, so what are we left with?